This pattern can be found on pages 98-101 of Knitting Green: Conversations and Planet-Friendly Projects, by Ann Budd with contributions from some of the knitwear industry’s leading designers. Bamboo and soya—a fiber derived from soybeans—rival silk in softness without the need to sacrifice silk moths. Both plants are highly renewable (bamboo grows to maturity in sixty days and soybeans are cultivated worldwide). 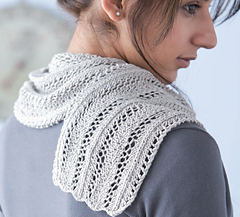 Ann Budd used the silky drape of these fibers to advantage in a reversible lace scarf that is worked in two halves and grafted together at the center. Stitches that are purled on one side are worked in a stockinette lace pattern on the other and vice versa, and the two cast-on edges form pretty scallops at the ends.